The Oxfordshire Business Directory helps you find a local business in Oxfordshire and also provides free online advertising for Oxfordshire small businesses, sole traders, service providers, tradesmen, etc. Why choose Oxfordlocals to market your company? This is a very simple answer, we ensure that every ad which is published in the directory gets the green light in terms of keyword research and that all adverts meet the Google guidelines. This ensures that your ad is Google friendly and that you can be found, not only on Oxfordlocals, but in the search engines as well. This is a win/win situation! Gumtree and all the other search directories do not offer this service, as this is a time consuming exercise. Hey Buddy!, I found this information for you: "Oxfordshire Business Directory". 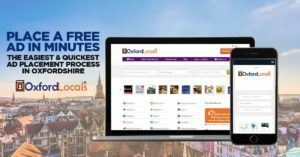 Here is the website link: https://oxfordlocals.com/oxfordshire-business-directory/. Thank you.